Up to 500 people have died in the past week from a heatwave in Hungary, a top health official has said. Anna Paldy, deputy director of the National Institute of Environmental Health, told the BBC that the figure included 230 deaths in central Hungary. The deaths - from 15 to 22 July - were caused by heatstroke, cardiovascular problems and other illnesses aggravated by the heat, she said. Some 30 people have also died in the heatwave in neighbouring Romania. 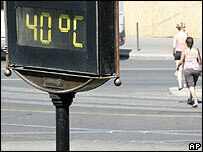 Ms Paldy told the BBC News website that the death rate from heat in Hungary was the highest in recent years. The daily mean temperature in the past week had reached 30C, she said. In the southern city of Kiskunhalas, the temperature reached a record high of 41.9C. In a 'normal' summer, the Atlantic jetstream directs areas of low pressure, which bring cloud and rain, to the north of the UK. High pressure systems over Europe and the Atlantic bring warm, settled conditions. This summer, the jetstream is flowing further south allowing low pressure systems to sweep straight over the centre of Britain. It is also pulling in warmer air from the sub-tropics and Africa which is sweeping over south-eastern Europe.